DOHA (VN) — Going over the audio tape, it’s hard to even hear Greg Van Avermaet. He blends into the noise in the similar fashion he blends into the peloton. He’s an incredibly solid classics rider but has remained, at least in the eyes of the American fan, somewhat anonymous. Last season he was constantly in the mix at the classics, finishing third at Gent-Wevelgem, fourth at Paris-Roubaix, seventh at the Ronde van Vlaanderen (Tour of Flanders), sixth at both Strade Bianche and Brabantse Pijl … ridiculous, really. 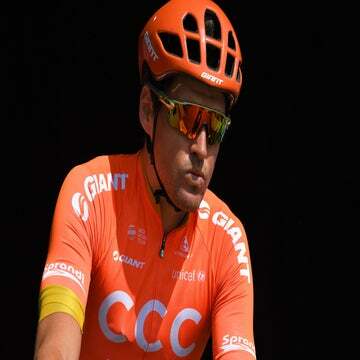 And this year, for the first time in his career, Van Avermaet is the leader of the northern classics squad. Philippe Gilbert will return his attention fully to his first loves in the Ardennes. Van Avermaet will look to marshal the BMC Racing troops and move up from last year’s consistent campaign to one of brilliance. And he cannot do that, cannot be better this year than the last, really, without winning. VeloNews caught up with the 28-year-old in the busy Ritz-Carlton lobby at the Tour of Qatar, as he arced his form toward the cobbles. He began riding at the age of 19 — late, for this sport’s standards — after he topped out as a professional soccer goalie on a first-division team. VeloNews: Why did you leave soccer? Greg Van Avermaet: I was doing pretty well. It was my biggest goal to be a goalkeeper on a top level. When I was 18, I didn’t play so much anymore. I was the second team, couldn’t do as much as I wanted to do. Then I started to do cycling, because my father and grandfather were cyclists … and yeah, it worked out well. VN: I’ll say. So you came over late. Do you feel like tactics are hard for you? That you maybe take more wind since you’ve not been racing as long as most of the guys? GVA: I think my technique is pretty good. I was already riding my bike when I was young, also … I rode my bike before. This helped me a lot to be a cyclist. I didn’t do cyclocross or any track racing. So I guess I was missing maybe a little bit. But it’s most important to try to learn as fast as possible. VN: Does it seem like a long time ago that you began racing? GVA: It went really fast. It’s strange. I still feel like a young guy who’s in his first year. A lot of experience now, but I still feel really, really young. It went really fast. I’m glad I made the choice. VN: If not a cyclist? Then what? GVA: Then maybe I was a football player. I’m always into sport. In my life, it’s all about sports. I’m always following the football pretty close. If I wasn’t a cyclist, I would try to go further into football and see if I could reach the highest level like I have in cycling. VN: You are at the highest level here, which you’ve got to be happy with. What do you feel like you need to do this season to notch that big win? GVA: It’s always hard to say this, because you think you have to do something better, or something special. Maybe do a little bit more. But I learned from the past year that it’s not about this. It’s more about being relaxed and just how you are doing. And be a little bit better. Like you said, I’m always there. I’m always doing top tens. But I’m not worried about this. I think I’m making every year good progress. Last year I felt like I had a big classic in me. It was not the year — this year, I just try to perform really good. VN: You think it helps you’re the guy for BMC? GVA: Yeah. In a way, yeah. It’s my first time. I was always kind of co-leader. And this year there will be some other leaders on the team, which is good I think … but I think I will be one of the best there. It feels good to have the confidence of the team and I think it will help me. VN: I know there were some off-season changes for the team in training, approach, etc. Why the decision to switch it up a bit? GVA: We were more focused on power… more specifics. It helped. For me, I don’t need it. I’m always a guy who was 200-percent living for sports. VN: BMC Racing has been cursed in the classics, it seems. Does it feel that way? GVA: Ah. Pressure, no. Not so much. We really want to do good. And like you said, we haven’t had the classic win. We have Flèche (Wallonne) with Cadel (Evans), but not a really big one. And we have a team that’s pretty good in the classics. It will finally come I hope. But I cannot say why it’s not happening. VN: What are you doing when you’re not training? GVA: I like to hang in the sun and relax a little with my girlfriend. … Go to some other cities that we don’t see in racing so much. VN: What’s on your mind when you’re out training? You’ve ample time to think. GVA: In training you always focus a little bit more on the workouts you do. … And sometimes it’s hard to think about something else. I really like to train. I really enjoy riding my bike. For me it’s not work. You always, sometimes you know your goals. For me, my goal is to win Flanders. VN: Remember your first bike? GVA: Yeah. I got it from my brother-in-law. He was pro with Lotto. He had a GT, and he gave it to me. I was riding with him while I was still a football player. And just about my talent … he couldn’t drop me as easy. He was the guy who said, “Maybe you should try it once in a race.” So then he have me this kind of present, this GT bike. It was my first. VN: Remember your first race then? GVA: It was a junior race. I had a vacation license. … I was so nervous. It was near Gent. My father, who was also a pro, just said to me, “Just stay in the peloton and see how it goes.” And I just did it. I didn’t attack. I went pretty easy in the peloton and could follow. It felt good … second race I could go in the attack [his father] said. VN: I guess it’s not bad advice, right? Just stay in the peloton and see what happens. GVA: Yeah. Best advice, I think. Don’t take any risk, and just see. Will it be lucky 13 for Van Avermaet at Flanders?